The widely accepted view that Australia is broadly in Asia without being part of Asia is being challenged as an assertive China, threats from North Korea, foreign fighters returning to the region and insurgency in the southern Philippines set us on course for much closer defence and security ties with Southeast Asian nations. 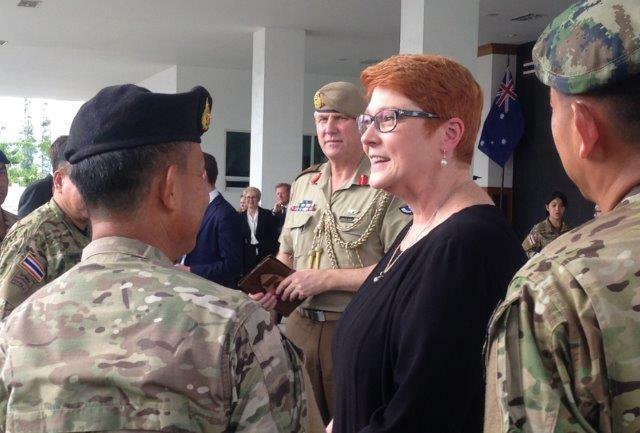 On a trip through Singapore, Thailand, Laos and Vietnam, the warmth with which Defence Minister Marise Payne was greeted by local defence ministers, prime ministers and military chiefs was telling. Senator Payne was accompanied by the ADF’s special operations commander, Major General Adam Findlay, who met his counterparts in each country for talks on regional security and counterterrorism. 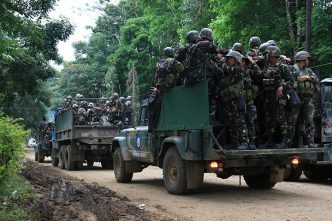 A number of nations in the region, and in ASEAN in particular, are increasingly using special forces as part of their counterterrorist response, the minister tells The Strategist. The minister says the nations she visited share Australia’s concerns about China, North Korea and terrorism. ‘There was a very consistent message from the leaders and from the defence ministers, particularly in relation to terrorism. To see a fellow member of ASEAN confronted in the way the Philippines has been has certainly got countries’ attention’, she says. ‘In terms of North Korea, there’s strong agreement with Australia that we expected the regime to observe the UN Security Council rulings to act in accordance with international law and that not doing so is a threat to regional stability and security. At a dinner in Hanoi, Vietnam’s Prime Minister Nguyen Xuan Phuc told the Australians that he was looking forward to hosting Malcolm Turnbull at November’s ASEAN–Australia special summit in Da Nang. The ‘comprehensive strategic partnership’ with Singapore is already as solid as it gets—with training of Singaporean pilots at RAAF Base Pearce in Western Australia and the massive expansion of training for Singaporean troops at Shoalwater Bay in Queensland. Foreign Minister Julie Bishop, Trade Minister Steven Ciobo and Senator Payne travelled to the island nation with a large business delegation. The focus of the talks in Singapore was on updating the Five Power Defence Arrangements, the agreement put in place by Australia, New Zealand, Malaysia, Singapore and Britain after the UK’s 1967 decision to withdraw its armed forces east of Suez. 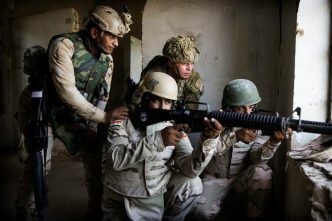 DFAT officials who attended the meetings say that in each country they found a level of interest in Australia’s work in counterterrorism in the region that they haven’t seen before. DFAT and the ADF have been quietly building foundations for these regional relationships for decades. Closer engagement was a goal of the 2016 Defence White Paper, and it will be developed further in the foreign affairs white paper that’s now being prepared. While Australia’s not a member of ASEAN, it plays a significant role on ASEAN Defence Ministers’ Meeting (ADMM-Plus) working groups. In December 2016, Australia hosted defence officials from across the region at a meeting of the ADMM-Plus Experts’ Working Group on Counter-Terrorism in Sydney which discussed the evolving threat of international terrorism, returning foreign fighters, the relationship between organised crime and terrorism, and opportunities for cooperation among nations to deal with these threats. Australia and Indonesia now co-chair the ADMM-Plus Experts’ Working Group on Peacekeeping Operations. ‘The ASEAN countries take those working groups very seriously and I think our input is well regarded and welcome’, says Senator Payne. 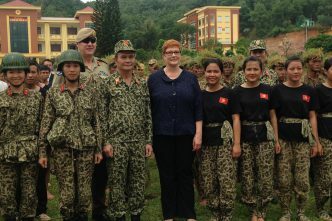 Senator Payne was the first Australian defence minister to visit Laos. ‘It’s about building relationships’, she says, ‘with a nation very close to both Thailand and Vietnam where Australia’s contact is much more deeply established’. In Vientiane, she handed out scholarship certificates to more than 30 students who will study at Australian universities. That’s a crucial element of Australia’s engagement in the region, she says. The years spent in Australia will significantly enhance the students’ English language skills and cement relationships. 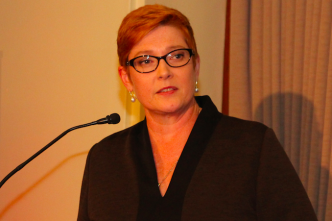 ‘It’s very beneficial for Defence to engage in that way given the strategic dynamic we face’, Senator Payne says. Education Minister Sengdeuane Lachanthaboune, a graduate of Deakin University in Geelong, tells the visitors there are now over 1,200 Australian-trained men and women working in Laos, many in senior positions in government, teaching and research and in business. ‘These scholars come back as highly qualified alumni’, Mrs Sengdeuane says. That’s particularly important as Laos seeks to graduate from least developed country status to integrate into the regional and global economy. She says great effort has gone into identifying where such ties can be reinforced. And if her recent engagement was anything to go by, then she has no doubt that the nations she visited regard Australia as a valuable ally in defence and security terms. 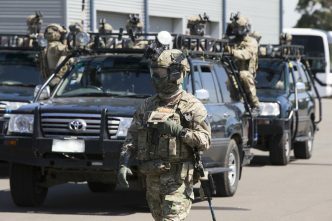 Does Australia’s membership of the Five Eyes intelligence-sharing alliance with the US, Britain, Canada and New Zealand increase its appeal to these nations in uncertain times? Brendan Nicholson is defence editor of The Strategist. Image courtesy of the author.